My husband's great grandmother, Hannah Peter[sen], was born in Norway circa 1863. She was in Red Hook, Brooklyn by at least 1886 when she and her husband, Fritz Kettler, a German longshoreman from Friesland, gave birth to a daughter, Marie. I assume that Hannah had some kith or kin in Red Hook but I have not been able to determine who that might be. Various sources state that Norwegians were arriving in Red Hook in relatively large numbers by 1870. Starting about 1873 and continuing to the early 1900s the Brooklyn Eagle is filled with ads by Norwegian girls and women looking for work. Common occupations sought were: general housework, cook, chambermaid, waitress, sewing, seamstress, washing and ironing, ladies maid, and even wet nurse. At the same time the harbor was filled with Norwegian ships and sailors. The sailors are frequently mentioned in connection with quarrels, drunkenness and fights. Some of these sailors came on Norwegian ships but many worked for ships operated by other countries, including American ships. Norwegian sailors were drawn to American ships by higher wages. As less Norwegian ships came to the port of New York more Norwegian sailors came on American ships. Hundreds of these sailors "jumped" ship and stayed permanently in Red Hook, working on the docks or establishing businesses in the neighborhood that catered to other Scandinavians. In the 1870s some Norwegians settled in Old South Brooklyn in order to be near the Red Hook Docks. Once established, some of these men sent home for their families: wives, children, sisters, brothers, mothers and fathers. In a list of 196 deaths that occurred in "Part of Ward 12" in 1869 there was only one person born in Norway, 45 year old, Olaff Rungmild laborer who died of Cholera. By 1885 he was listed in Chicago. The congregation of Our Savior moved to Brooklyn in 1878(?). 1888: Rev Charles S Everson, h 163 3rd place. 1892: Brooklyn Ward 6, Charles Everson, Norway 44, clergyman, Ambj, 37, US, Clara 14 US, Augusta 10, US and a servant. THE REV. CHARLES SEVERIN EVERSON The Rev. Charles Severin Everson, pastor Emeritus of the Norwegian Evangelical Lutheran Church of Our Saviour, 632 Henry Street, Brooklyn, of which he had been pastor from 1878 to 1918 and known as the oldest pastor in service of the Norwegian churches in the East, died on Tuesday at his residence adjoining the church. He was 73 years old. Mr. Everson was born in Norway and came to this county in 1849, settling in the West. He attended Luther College in Iowa, and the Concordia Seminary in St. Louis, Mo., and his first call as pastor was to the Danish-Norwegian Lutheran Congregation of Our Saviour in Perth Amboy, N. J." Probate: $4,500, widow Anhjor Everson 630 Henry st.
1892: Ward 12, Louis M Larson salesman, 47 Norway, Gurgine 40 Norway, Carl B 15, Lydia, 11, Agnes 7, Olga 4, Ferdinand2, children all born US. All of the Brooklyn addresses I have found so far connected to Hanna Petersen were in Ward 12 south of Hamilton Avenue. The 1870 census for Ward 12 included 459 pages or about 18,340 people. Local Norwegian leaders claimed that the Norwegian population in New York and Brooklyn was actually much larger than the 1870 census indicated. David C. Mauk in "The Colony that Rose from the Sea" said the 1870 census showed 372 Norwegians in New York and 301 in Brooklyn. Ancestry.com lists 293 in Brooklyn. A survey of Ward 12 in the 1870 census revealed 19 households that included one or more Norwegian born family members. This included: fifteen adult males born in Norway and nine adult females born in Norway. Thriteen of the males were married: two to women born in the US, six to women born in Ireland, two to women born in Germany and three to women born in Norway. One male, age 23, was the son of one of the eight married females. There does not appear to have been many singe Norwegian women in Ward 12 in 1870 so choices of brides was potently limited to the few Norwegian females, US born females or females from other immigrant populations. Ward 12's foreign born population in 1870 was predominately Irish. There was also a large community of Germans. 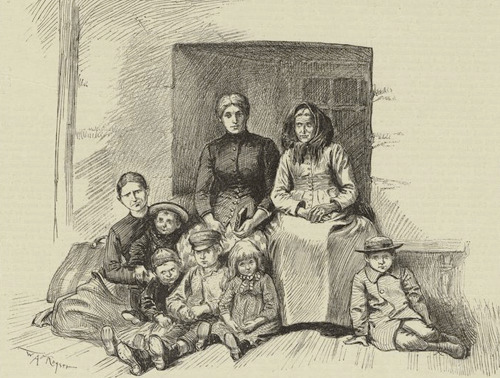 All of the known children of two of the adult males married to Norwegian women were born in the US, so it is not known if the marriage occurred in Norway or the US. It is assumed that the one female, with an adult son born in Norway, was married in Norway (or Denmark where her husband was repordedly from). Male occupations were: unknown, saleman, 2 boatmen, two watchman, policeman, 3 laborers, carpenter, lighterman, two sail makers and a painter. One Norwegian woman was married to a Dane. Four were married to Norwegian men. The remaining females were either single, widowed or married but were not listed with a husband. This census does not give marital status. The woman married to the Dane has a son born in Norway circa 1847. They were in New York by 1852, in Wisconsin circa 1855 and back in New York by c 1857. Only two female occupations were give: domestic and dressmaker. One woman, a non Norwegian born in Prussia, had several children listed as born in Prussia and two children ages 5 and 3 born in Noway. No father or husband was listed with them. This very small sample of mid 19th century Norwegian immigrants indicate at least one male who came to the US as early as 1849. His children were born in both New Jersey and New York. One family was in New York in 1852, in Wisconsin in 1855, and back to New York by 1858. Six of the families were in the US before 1860. I did not follow all of the families until 1880. Three of the families were still in Red Hook in 1880 (an additional family was still in Red Hook in 1875). Five of the families were no longer in Red Hook by 1880. With family born in Massachusetts, Ancestry.com 1870 Census Ward 12, image 5. Ancestry.com 1870 Census Ward 12, image 69. Edward floor married Sophie who was born in Norway circa 1888 and who immigrated to the US circa 1895. They had one son Edward Jr circa 1909. Edward sr was a janitor and super in an office buiding in Manhattan. In 1910 and 1920 they were on Williams st, Manhattan. 1879, 1880: Floor Andrew, sailmke 32 Hamilton av h 54 cleever place and By 1882 he was on Sackett street. 1886: July, Andrew Floor, "Court street saloon keeper" was assaulted by two men in his establishment. The men nocked him down and drank several bottles of champagne. Floor did not press charges. (BE). The New York Times listed his saloon at 9 Union Street. Ancestry.com 1870 Census Ward 12, image 286. Lewis (Louis) Hansen was in the United States as early as 1849, as indicated by the birth of his daughter Mary as listed on the 1860 and 1870 censuses. Ancestry.com 1870 Census Ward 12, image 337. Ancestry.com 1870 Census Ward 12, image 342. NOT listed in the Brooklyn Directories 1870 to 1876 none of them on Conover or Summit. Ancestry.com 1870 Census Ward 12, image 377. Ancestry.com 1870 Census Ward 12, image 401. Ancestry.com 1870 Census Ward 12, image 405. Johanna was NOT listed in 1870. Ancestry.com 1870 Census Ward 12, image 407. 1875: Ward 12, ED1, 148 Van Brunt, brick $3,500 Thomas Anderson	M	40	Norway, boatman, Wife	Margret Anderson	F	40, Ireland, Son	Samuel Anderson	M	7	Kings. co, four families in building, all the family heads born Ireland . Ancestry.com 1870 Census Ward 12, image 414. 1875: Ward 12, ED3, Van Brunt, brick 2 family, "Ranphill", Ericson, age 51 Norway, John E., 24, son Norway, cooper, Ellen A. daughter 15, Norway, Richard son 13, Brooklyn, two boarders born in US. Charles, 8, New York Ancestry.com 1870 Census Ward 12, image 415.
and boarders Ancestry.com 1870 Census Ward 12, image 423. Ancestry.com 1870 Census Ward 12, image 423. Nothing else on this name. In 1875 four of the 14 Norwegian "families" listed in 1870 were still in Red Hook: Nels Johnson, Thomas Anderson, Frederick & Rosanna Anderson, and Rungmilt. There were a total of 14 adult males: 7 married to Norwegian wives, two married to German wives, two married to Irish wives, 3 single males. There were 13 adult females born in Norway, three were attached to husbands. One was married to a Dane. One was married to a Swede. One was married to a German. The remaining seven were married to Norwegians. Male occupations included: 5 laborers, 2 lightermen, 1 boatman, 4 ship carpenters, 1 shoemaker, and a salesman. NONE of the women were listed with an occupation. The families were listed in 6 of the eight EDs: five in ED 1, three in ED 2, 1 each in ED 3 and 4, none in EDs 5 and 6, six in ED 7 and three in ED 8. The infomation is generally too vague to determine the dates of immigration. There were five Norwegian "families" in ED 1. Three of them were listed in the 1870 Census: Nels Johnson, Thomas Anderson, and Fredrick & Rosanna Anderson. See Nels Johnson and family, above. ED 1, 1875: Ward 12, ED1, 148 Van Brunt, brick $3,500 Thomas Anderson	M	40	Norway, boatman, Wife Margret Anderson	F	40, Ireland, Son	Samuel Anderson	M	7	Kings. co, four families in building, all the family heads born Ireland . ED 1 229 Conover, frame, three family, James Knudsen, Norway, age 36, lighterman, Elizabeth Knudson, wife, Germany, Mary 6 Kings, John 5, Kings, Peter 3 Kings, James 4 months, Kings. ED 3 Tremont St includes Van Brunt St, Verona St, William St, King St, Sullivan St per www.bklyn-genealogy - One family listed in this ED. There were in the 1870 census, See above. ED 3, 1875: Ward 12, ED3, Van Brunt, brick 2 family, "Ranphill", Ericson, age 51 Norway, John E., 24, son Norway, cooper, Ellen A. daughter 15, Norway, Richard son 13, Brooklyn, two boarders born in US. ED 7, image 15, Henry Johnson, 28, Norway, ship carpenter, Annie 25, wife, Norway. 1876 Directory: Henry Johnson, carpenter 31 Garnet st. NOT listed in 1877 or 1878. ED8, image 6, George Kruss, 28, Germany, bookkeeper, Christina, wife 22, Norway, Fredrick son 2 Mass. ED8, image 10, Catherine Jansen, 54, mother, Norway, Charlese (cannot read, not Jansen) age 18, Kings, "opperator"
By 1880 the Norwegian population in Ward 12 had increased substantially. There were 64 households listed: none in ED 096, 8 in ED 097, 21 in ED 098, 20 in ED 099, 1 in ED 100, 1 in ED 101, 4 in ED 102, 3 in ED 103 and 6 in ED 104. Ward 12, 098 image 19, Nelson, Charles, boarder age 46, watchman, Norway, Nelson, Mary, seamstress, boarder, Ireland. Ward 12 ED 098 image 37, Conover street, Jersen, Henry, 27 boarder, bartender, Norway, Yorland, Bors, 41 tinsmith, boarder, Norway. Ward 12, ED 099, image 3, Hamilton, Olsen, Jacob, 46, shoemaker, Norway, Jane, 44 wife, born Finland, parents born Norway. Ward 12, ED 099, image 12, Hamilton ave, Jebsen, Fredrika 29, keeping house, Norway, father born Germany mother born Norway, Peter, son 5 born Norway, Emily daughter 3, New York, Carl son 1 born New York, Fritag, Zachareus, 19 nephew, carpenter, Norway. Ward 12, ED 099, image 19, Conover st., Ellengard, Lewis, 48, laborer, Chrsitina 45, wife, John 17, Emily 11, Anna 8, all born Norway. Ward 12, ED 099, image 47, Van Brunt st., Rynders, Julius, 34, boarder, sailor, Norway. Ward 12, ED 099, image 48, Van Brunt, Rollin, Wm 35, carpenter, Norway, Regina, 45, wife, Norway Anderson, Edward, step son carpenter, 28, Anderson, Andrew, step son, 17, carpenters apprentice, Anderson, Paul step son, 14, works in hat factory all born Norway. Ward 12, ED 099, image 50, Van Dixon, Martin age 16, Norway, boarder works for junk dealer - he was living in the same dwelling as the Irish junk dealer, Michael Shea. Ward 12, ED 099, image 53 next to above listing, SKantze, Andrew, 35, shoemaker, Norway, Maria 35, wife, Norway, Celia 8, Laura 6, Anton 4, Gumer 2, Olsen, Oloff, 22 boarder, sailor, all born Norway. Ward 12 ED 099, image 53, next to above listing with a family of Swedes, Norman, John 23, boarder, works for ship chandler, Norway. Ward 12, ED 099, image 61 (of 61), Erickson, Margaret, 55, keeping house, John 28, son, cooper, Ellen 20 daughter shirt maker, Richards son 17, fireman, all born Norway. Ward 12, ED 100, image 20, Liquer st Johnston, Thomas, 31 laborer, Norway, May 29 wife, Ireland, Marie 10 daughter, New York. Note: This ED includes Center Street and Hamilton Ave.
Ward 12, ED 102, image 22 and 23, Asperheim, Ole, 35, clergyman, Clinton street, Norway, Sophia, wife, 28, Norway, August, 3 Wisconsin, Alfred 3 Wisconsin, Sophia one months, New York Larson, Brig, 60 mother in law, Norway, Hanson, Christine, 20 servant Denmark, Hanson, Sofus, 4, son, Wisconsin, parents born Norway. Ward 12, ED 103, images 9, Garnet street, Lars, John 36, carpenter, Norway, Christine wife, Norway, Joseph son 4 Norway, Carl son 2, Norway, Lorenzo son 1 months New York. Ward 12, Ed 104, Henry street, image 32, Myers, Francis, 60 lighterman, Norway, Bridget 44 wife, New Foundland, father born Norway, mother born New Foundland, Nord, Peter, son in law, lighterman, Norway, Ann daughter age 20, born New Foundland, Francis son age 5 months born New York, domestic servant born Newfoundland. Ward 12 ED 104 image 38, Nelson st. Larson, Thomas, 42, ship carpenter, Norway, Amelia 41 wife, Norway, Hea---- daughter, 11 born Norway. This census does not give addresses and relationships. Joseph Dagland, 27, Norway, painter, page 6 conover St.
Charles Hansen, 35, Norway boatman, Josephine Hansen 35, Norway page 6. Death: 1912, February 13, Probate Beret AAbue, 149 Van dyke children John 186 Seeley St, Fred 1342 Prosepct, August 149 Van Dyke, Bernard Kings Park State Hospital for the Insane, Severina Olsen 549 52nd street, Jetta Isaksen 729 53rd st, Richard Jessen grandson 727 53rd street. Page marked at top "93 Ferris Street". The gender indications of some of these entries on this page are clearly off. Johann Holm 58 Norway, no occupation, page 8, maybe a servant with a family all born US. There are a number of Swedes and Danes mixed in with this lot. pages 12 and 13- a lot of Italians on these pages and page 10. Thomas Thomson 52, carpenter, Ottela, 44, (F) Thomas 17, Anny 11, Olaf 5, Aleck 20, all born Norway. I started recording everyone but the majority are single men living in boarding houses and their names are very common, making it pretty hard to track them over time. For the rest of the EDs I am only going to record families and simply count the single men and woman with a notation of the page number. Page 2, 6 males: 24, lab., 33, lab., 35, lab. 28, lab., 35, lab, 36, lab. On top of page 11 "77 Dikeman"
Page 15: 5 males, 26, sailor , 21, lab., 41, lab., 23, captain, 28 lab. Top of 1st page 160 Richards st.
Sorenson, John 43, lighterman, born Norway, Mary 33, James 17 driver, John 13, Thomas Lester 6 all born US, page 4. Top of page 9 " 319 Van Brunt"
Markussen Peter 41 carpenter, Sophia 30, born born Norway, Lillie 7, Peter Bernardt 1 both born US, page 9. John Peterson 30 sailor, Peter Peterson 28, sailor appear to be in the same household - single males I am listing with their names because of my personal interest in the name, Peterson. John Christie 38, sailmaker, Detia 32, both born Norway, Cora 10, Hilda 7, Ann 2 born US, page 18. Gustave Kaurin 38, bartender, born Norway, Mary, 29, Clara 12, Gustave, 10, Nettie, 8 ella 6, Alfred 2 Alice 5, all born US, page 19. Oscar Hanker 32 lab., Millie Hanker 26, Oscar Jr 1 (US) Ellen Hanker y all born Norway except Oscar Hanker Jr. Duplicate of page 7. For some strange reason pages 7 and 10 are the same. PAGE 12, Seabring, st Richards Ferris 223 Conover st entered at top of page. Theodora Johnson, 20 (F) housekeeper, Attalia (F) housekeeper, Peter 26, engineer, Othelia (F) 31, dressmaker, all born Norway, Theodore (M) age 2 months US, John Johnson 26, deckhand, Henry Johnson 52, carpenter, all except Theodore age 2 months born Norway. James Petersen 30 deckhand, Mary 25, both born NOrway. PAGE 18 - 136 Hamilton AVe. PAGE 19 - 39 Rapayle st.
John Jacobson, 20 dock builder, Levina 27, Jacob, 39 dock builder. 35, sailor, 26, sailor, 27 sailor, 23, sailor, 21 sailor, 30 sailor, 21 sailor AND 40 year old female no occupation, all born Norway. Inghberg Nelson (F), 41, no occupation, Laura 6 US, Inket 14 (F) NOR, Nills 45 lab. Singles Seonen [?] Peterson no occupation, Goulic Johnson 40 carpenter, Carolien Olsen (F) 40 no occupation. Louis Anderson, dock builder, Jacob 21 carpenter, Bertha 45, Elizabeth 19, all NOR., Laura 8 US. John Edwards 33 lab. Lena 35, both NOR. Christopher Anderson 36 lighterman, NOR Lena Christson 33 NOR. Ham B Hencheekson, 33 seafaring, Carolina 34, Elina 8, Allen 6 all NOR. Rasmus Olsen 47 train hand, Amelia 40, Olef 14 all NOR, Robert 8, Edward 5, Engeal 2, all US, Andrew 17 NOR. PAGE 20 (following page 17) Are there pages missing or is it mislabeled? Henry Ingebrietson 25 NOR carpenter, Emily 18, NOR. Jacob Anderson boatman, 31, Marie 18 both Norway. John Jacobson, 34 NORWAY porter, Sene 32, Denmark, Jennie, 7, Laura 5, Annie 3 Harold, 2, all US, Nils Jacobson 37 porter, Norway. Caspara female Hedemark Walter Olsen 34 lighterman, Randina Olsen 25, all born NOR. singles: 21 lighterman, 40 lighterman, 30 rigger, plus Beirgethe Nilson 34 and Anna Nlson 2 US all adults NOrway in the middle of the Noble family from Scotland. Fredrick Olsen 32, no occupation, Ida 34, both Norway, Olga 4 US, Oscar 2 US. Hary Martin 22 NOR, "housesmith"
Henry Jensen, clerk, 32, Annie 43, both NOR, Brunhilda 9 US, Dietmark Christison 18 NOR lab. PAGE 25, West 9th street. Sers. Sjoberg, 38, furniture, Anna 38,both NOR. sigles 40 boatman, 27 lab, 30 lab. On May 17 Norwegians celebrated Constitution Day their equivalent of the US July 4th, Independence Day. Holiday attire is donned, flags are raised and parades and celebrations are held. 1860: In 1860 Brooklyn Norwegians celebrated the 17th of May. In Brooklyn in 1889 the Norwegians held a celebration in Schuetzen Park. Cannons boomed and flags waved. There were fireworks, speeches, dancing and singing. Nearly 1,000 Norwegians and Swedes joined in the festivities and merrymaking which went on until late in the night. In 1894 festivities were held in Schuetzen Park, Third Ave South Brooklyn. 5'o clock in the evening members of the Norwegian singing Society left their quarters at 217 Court street and proceeded by open carriages to the park. At the park there was band music, dancing and fireworks. In September 1891 about 600 Brooklyn Norwegians celebrated Lief Ericssons' discovery of America in the year 1000. The celebrations comprised a parade, concert, banquet and ball. The headquarters of the Norwegian-American Seamen's Association was given as "the corner of Van Brunt and Vandyke". The torchlight parade, which started at 7:30, featured a float holding a sixteen feet facsimile of a Viking ship, fully armored and manned with costumed seamen carrying spears and shields. There were several bands and groups of marching men waving both Norwegian and American flags. The route was through Van Brunt to Hamilton to Columbia, to Union, to Henry, to Atlantic, to Court street, to City Hall, to Fulton Street, to Saengerbund hall, where the celebrations were continued. As the paraders moved along they were greeted with blazing bonfires and pyrotechnic displays. At Saengerbunt hall the gathering enjoyed a band concert, folk songs, speeches in Norwegian. The were entertained by the Norwegian singing society its boys and men all dressed in "white sailor togs trimmed in blue". Dancing followed. The hall was decorated with flags, chinese lanterns and bunting. They had held a similar celebration in 1890 and again in 1892. It was so successful the first year that it was hoped to make it an annual event. At a celebration in Ft. Green Park in 1909 "Norwegian children furnished one of the floats representing Leif Ericson and his viking crew discovering America in 1000 A. D.. In 1899 about 3,500 Norwegians celebrated Leif Ericson day in Prospect Hall on Prospect Avenue. For the first time all "eleven" Norwegian societies from both Manhattan and Brooklyn united for the celebration. A parade started from Hamilton Aven and Van Brunt, muched up Van Brunt to Union, to Nevins, to Warren, to Fifth, to Prospect avenue, where they arrived around 10 o'clock. The festivities included speeches and dancing. Several reproductions of explorers ships were present at the Chicago World's Fair. These included the Nina, the Pinta and the Santa Marie, the ships on which Christopher Columbus and his crew made their historic voyage in 1892. Not to be outdone, the Scandinavians built their own replica, the Little Viking, a reproduction of the ship Leif Ericson sailed to America around 1000. On her way to Chicago the Little viking stopped in New York and received a warm welcome from the Norwegian population of the city. She was towed through the Narrows by the tug John Fuller and accompanied by the steamer Laura M Starin. As she approached Brooklyn she was joined by a fleet of steamboats, schooner, sloops, catboats, excursion boats, yachts and tugs with flags flying and whistles blowing. The excursion boats were well supplied with music, food and drink. The Norwegians shouted and san themselves hoarse. When the viking finally reached the North River she was greeted by a twenty one gun salute. The festivities went on for hours. Comments were made about the Norwegian men being, handsome, tall, broad shouldered, strong, naturally blond, with bronzed faces and strong hands. In was stated in the 1892 Brooklyn Eagle revue of the Ericson festivities that "in small as well as large matters the Norwegian have allowed themselves to be thrown in with and mixed up with other nationalities, as up to the present time they have been without any individual undertakings to bring themselves prominently before the public as an independent nation." Fights among sailors of every nationality seemed quite common and the Norwegian sailer was no exception. In 1873 two Sailor fought on the Norwegian bark Alliance docked in the south Middle Pier of the Atlantic dock. The scuffle was over a small amount of money. The result - one man stabbed in the chest, in serious but not fatal condition. In 1889 the mate of the Norwegian bark Daemring shot a killed a boarding house runner "of the dangerous and desperate type which infest the docks in the southern section of the city." The runner had intruded on the ship and his behavior was "truculent, defiant, and aggravating". The mate feared the "runner" was about to pull a gun. He claimed to have shot in self defense. 1891: Norwegian newspaper Nordick Tidende founded in 1891 later edited by A. N. Rygg. In 1894 a grand jury indicted Emil Neilsen, editor and proprietor of the Nordisk Tidende for libel regarding several articles he published charging Karl Woxen, the Norwegian council in New York with ill treatment of the crew of the shipwrecked bark Dogny. 1891: Norwegian American Seamen's Association held it first annual ball at Saengerbund hall, corner of Smith and Schermerhorn streets. The week before they had held a fund raising bazaar. The proceeds of both events was scheduled to go for the raising of a permanent quarters for the association. 1891: In May a soiree of the Norwegian American seamen's association was held at the Lyceumopera house on Thirty Forth and Third ave in New york City. 1892 and 1803: Norwegian American Seamen's Association Scandia hall cor. Court and Union streets. 1897 Norwegian American Seamen's Association - Sanctorium Hall. cor. Court and Union sts, Brooklyn. The Norwegian Society of New York (Det Norske Selskap i New York) organized in 1871 and incorporated 1878, located at 192 Third Ave was a Mutual benefit and benevolent association. Its members were among the elite of the Norwegian immigrant population. In 1892 and 1893 the Norwegian Singing Society was located at 217 Court Street. 1897: Nordmaendens Sanforening i Brooklyn - The Norseman's Singing Society Organized had 40 members in 1897. The Norwegian Deaconess Home and Hospital began in 1883 when Sister Elizabeth Fedde came to Brooklyn at the request of the the Norwegian Council in New York and the Norwegian Seamen's Church. The intention was to provide medical (and other) services to Norwegian seamen and immigrants. Initially three small rooms were rented next to the Norwegian Seamen's Church on Williams [Pioneer] Street. In 1885 the name Norwegian Relief Society was adopted and 441 Fourth Avenue became the temporary home of the Deaconess Hospital. 1889: In 1889 the Norwegian Relief Society was about to erect a three story frame hospital, 43x54, at a cost of $10,000, on the southwest corner of 56th street and 4th Avenue. When the hospital opened in 1892 was quite a distance from Red Hook where the bulk of the Norwegian population of Brooklyn still lived. 1890: The Norwegian Relief Society of Gowanus "more properly the Deaconess Home" was admitted to membership in the Hospital Saturday and Sunday association. 1893: Listed under preparations of the arrival of the ship Viking. Both Lutheran and Methodist congregation set up institutions for the Norwegian population of South Brooklyn. They were in competition with each other in the business of saving the souls of Norwegian sailors - primarily by discouraging drinking and other vices found along the waterfront. The Methodists were active proselytizers. The Bethel Mission of the Norwegian Methodist church in Brooklyn was originally housed in a ship that was docked at Red Hook Point in 1876. Ole Helland, a former sailor turned preacher, was the inspiration of this "mission" to bring temperance and religion to the Norwegian seaman. In 1881 the Bethel Ship Norwegian Methodist Episcopal church was erected at the southwest corner of President and Van Brunt. The building was a "neat looking structure" and "built of best quality of brick and finished with blue stone." The lot was 50x100 feet and the building was 38x65 feet. A porch faced President street. On either side of the porch were classrooms. On the second floor was a large room intended for prayer and other types of meetings. The Bethel Mission was built to provide for the needs of the Norwegian sailors in Brooklyn and took the place of the floating Bethel Mission that had been docked at Pier 11 in New York and later brought to Red Hook. The mission was well supplied with Bibles, Testaments, tracts, and pamphlets in Norwegian. By 1903 this building was labeled "Missionary Sisters of the Sacred Heart School". Bethel Missions, or shelters for men (and women) can be found all over the country. In 1901 there was a Bethel Mission at 1254 Myrtle Ave.
Lutheranism was the state religion of Norway. The Lutheran Synod felt that the sailors in Brooklyn should be ministered to by the international organization, the Society for the Preaching of the Gospel to Scandinavian Seamen in Foreign Ports also called the Norwegian Seamen's Mission. The Norwegian Seamen's Mission was established on William (Pioneer) Street in 1878 with the intention of only catering to seamen. Because the nature and number of Norwegian seamen versus settlers was unclear the Synod did not take into consideration the spiritual needs of the established Norwegian families in South Brooklyn. Thereby leaving the religious Norwegian to go to Manhattan, the Norwegian Methodist church or some other non Norwegian congregation. In 1885 St. Matthews Evangelical Lutheran Church on Henry between 4th and 5th held services in Norwegian, German and English. From 1870 to about 1910, Hamilton Avenue, Brooklyn, was in its full glory as a Norwegian thoroughfare, and there were both good and bad reasons for it. The Hamilton Ferry was in those days one of the main connections between Brooklyn and New York and in the nearby Erie Basin and Atlantic Basin there was always to be found a large number of Norwegian ships. Hamilton Avenue was filled with saloons and dives which made a specialty of catering to the generous and open-handed Norwegian sailors. And when the crews came off the ships in the evenings there was life and activity along the notorious Avenue. Many a fine young man has been fleeced of his hard-earned money and has come to grief, morally and physically, along this thoroughfare and its neighborhood. Some of these saloons had bedrooms upstairs, where the drunken sailors could be robbed of their money at leisure. In order to counteract the evil influences of the district, the Norwegian Seamen's Church and the Norwegian Sailors' Home were established nearby. Nowadays, however, Hamilton Avenue is merely a pale memory of its former self. The first Norwegian community which has an unbroken connection with the present one was located about 1830 in the area now bounded by the Brooklyn Bridge, the Manhattan Bridge, and the East River. At that time, along this section of Manhattan were located docks where ships from all parts of the world loaded and unloaded and here were also located the only large dry- docks in New York, capable of repairing large ocean-going vessels The Norwegians living in New York found the journey by horsecar and ferry tedious and time-consuming. They soon began to settle in Red Hook and the next Norwegian settlement developed in the area immediately adjacent to and north of Red Hook, where a small group of Norwegians settled in 1850. By 1870 the invasion of Brooklyn was gathering speed. A horsecar, traveling along South Street in Manhattan, took Norwegian ship workers to Whitehall. Here they boarded the Hamilton Ferry to Hamilton Avenue, Brooklyn. Between 1870 and 1910, Hamilton Avenue became the most Norwegian street in Brooklyn and New York. The colony developed to the north of Hamilton Avenue. The churches moved over from New York and new churches were established. In the Nineties, this section was one of large beautiful homes and tree-shaded streets. The section became better as one went north and became very exclusive at Brooklyn Heights where the grand old families lived. Note: This paragraph appears to have been originally from a paper written in 1949 by Frank Hamilton Hankins but it also appears under other authors in the 1960s and later.